I have decided to post the weekend premium report to the blog this week. 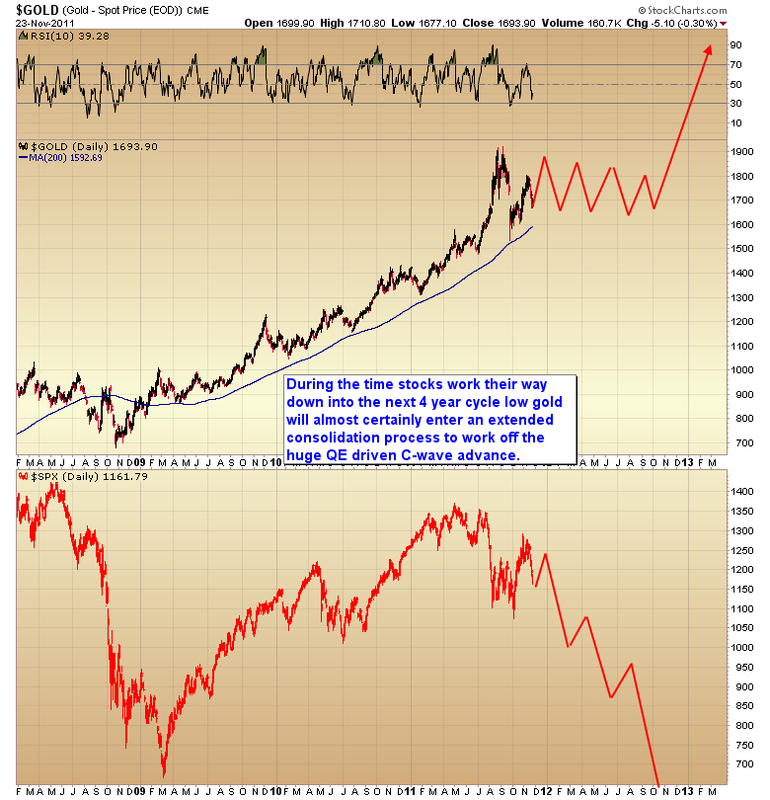 In the report I’m going to take a look at what has transpired, and what is likely to come, as the third leg down in the secular bear market begins to intensify. Back in April of this year I warned investors to get out of stocks in their 401(k) accounts. At the time the dollar was moving into the timing band for a major three year cycle low. It has always been my expectation that the rally out of that major bottom would correspond with the stock market moving down into the third bear market leg of the secular trend that has been in place since 2000. As we now know the dollar did bottom in May of this year and that did correspond with the top of the cyclical bull market that began in March of 2009. It has also been my expectation that the next four year cycle low would occur in the fall of 2012, and that 2012 would be one of the worst economic years in human history. This is already starting to unfold across the globe as social unrest that began in the middle east has spread to Europe and now the United States. Economic data has been steadily eroding for months now. 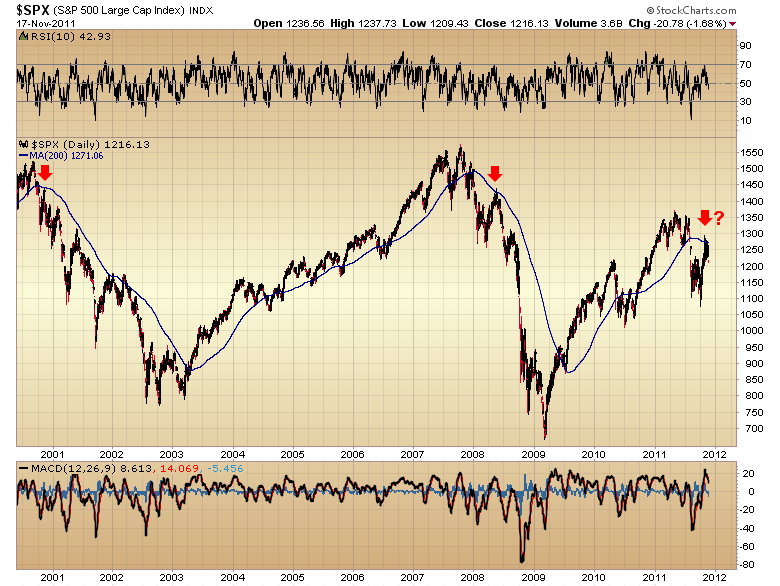 We should expect this trend to continue and intensify as we get into 2012. As most of you know I use cycles analysis and sentiment to determine likely timing band’s for major turns in the stock market, gold and the dollar. This is what allowed me to anticipate a bottom in the dollar cycle at a time when everyone was expecting the dollar to collapse, and a top in the stock market when everyone was bullish and expecting a move back to new highs. An interesting development in the yearly cycle for the stock market has now emerged. Generally speaking most yearly cycles tend to run about 12 months trough to trough. However the Fed’s quantitative easing programs have stretched the yearly cycles from March 2009 into June of 2010, and this year the yearly cycle has stretched again to arrive in October. The market is now set up for the next yearly cycle low to occur in the fall of 2012, which, not surprisingly, is exactly when I have been expecting the next four year cycle low in stocks to bottom. I have also indicated the expected timing band’s for the next three intermediate degree cycle lows. 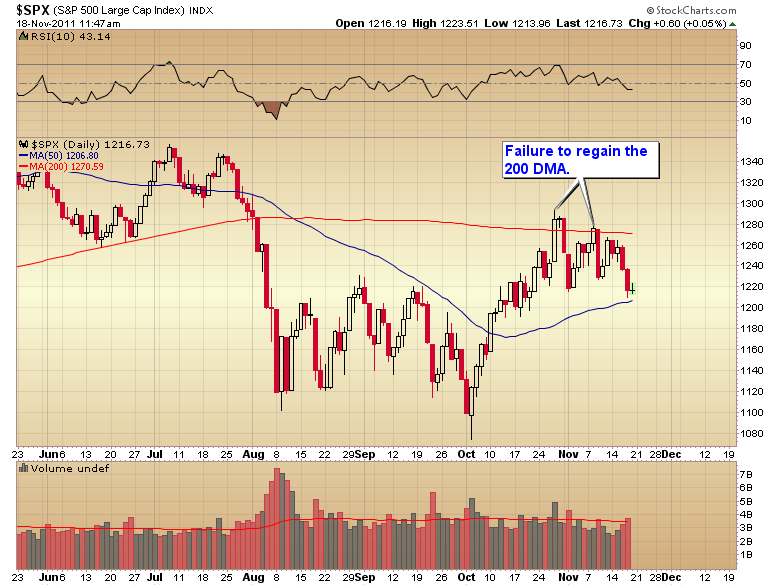 For reasons explained in the nightly reports I don’t think the current decline is going to move below the October low. I expect we will find a bottom sometime in the next 1-4 days followed by a Santa Claus rally into the middle of December. If the market avoids making a lower low it will embolden the Bulls to continue holding long positions. The hope for a miracle will be misplaced though as the market will almost certainly begin to roll over before making higher highs and by the next intermediate degree bottom in February/March we will see the October lows broken, and the summer 2010 lows tested. 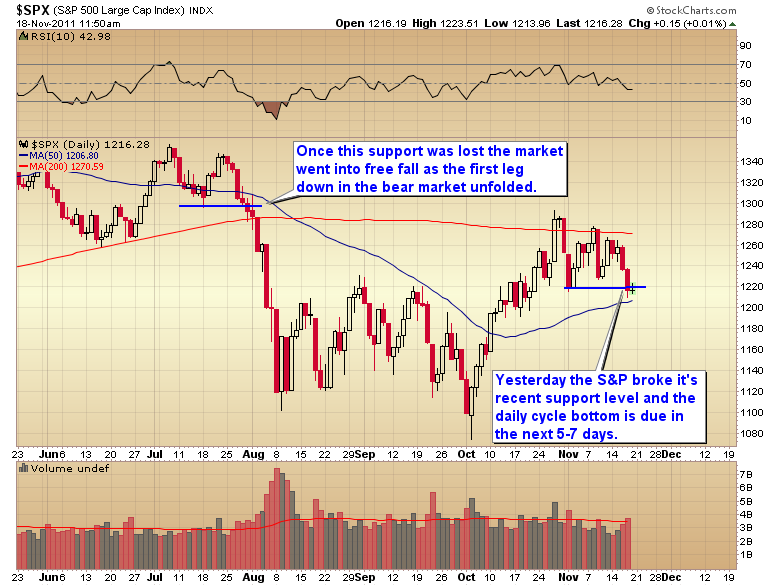 The recent rally out of the October low will undoubtedly be the most powerful countertrend rally of this bear market. Any further countertrend rallies, and there will be several, are likely to be short-lived and weak. The window of opportunity for these long side trades are probably going to be too brief for the average investor/trader to successfully trade. From this point on investors should keep 401(k) accounts solely in money market funds until we reach the bottom sometime in the fall of 2012. This brings us to the topic of gold. Despite what is happening in the stock market gold is clearly still in a secular bull market. That being said the days of easy money from the gold bull are probably over for the next year as stocks move down into their four year cycle low. In the chart below you can clearly see the affects QE1 & 2 had on the gold bull. They drove the largest C-wave advance of this entire secular bull market. However, for reasons that I will explain below I think the C-wave topped in September and gold is now going to enter an extended consolidation phase for the next year. That begs the question if the C-wave has topped then where was the D-wave? Well I think we just saw it in September. Let me explain. Because of the massive liquidity floating around the world I now think the D-wave terminated with the overnight spike down to $1535 on September 26. I’m now seriously considering that the last D-wave was exceptionally mild because of the extreme global liquidity. 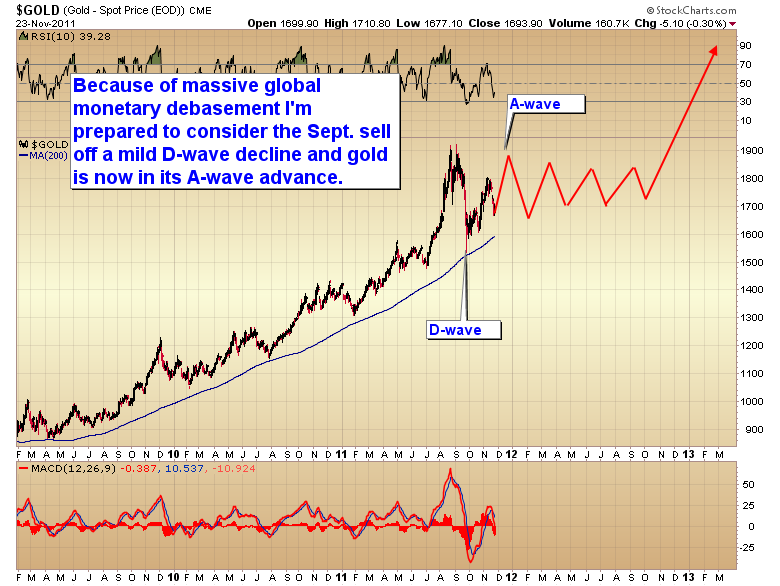 If that is the case then gold has now entered an A-wave advance. As most of you know A-waves don’t tend to make new highs. So my best guess is that gold will test the $1900 level sometime in the next three weeks followed by an extended corrective move down into an intermediate degree bottom in February (B-wave). That bottom should hold above the $1535 level. What should then follow will be a year long frustrating, whipsawing, consolidation that should terminate slightly before the stock market bottoms in the fall of 2012. At that point gold will start to sniff out the next round of massive quantitative easing as the Fed and central banks around the world go into full panic mode and begin printing unimaginable amounts of money in the attempt to halt the global sovereign debt implosions and economic depression that will have developed. As usual central planners will not account for the unintended consequences of their actions. This time quantitative easing is going to have the opposite affect that it did in 2009. Yes it will put a bottom in stocks, at least temporarily, but it is also going accelerate the cancer that has now infected currency markets. And as currencies start to collapse so will global bond markets. This is the recipe for the final bubble phase in the gold bull market. While gold is in this long consolidation phase/bear market phase for stocks, trading strategies will be vastly different than they were during QE1 and QE2. Trades are going to be shorter and there will be long periods of time where the correct strategy is to just sit in cash. I started to make the transition to this new trading strategy back in July. The recent breakdown in stocks has now eliminated any reservations I had about the bear market. With that confirmed, there is little doubt that gold has now entered an extended consolidation and that new trading strategies are called for. Make no mistake, we are now entering what will be one of the toughest markets ever to make money in. So far the model portfolio is performing admirably even in these tough conditions. 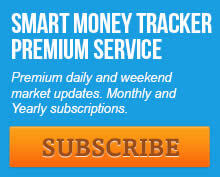 For anyone who would like to sample the nightly premium newsletter, I have opened a $10 one week trial subscription. You will have full access to the SMT premium website including all historical archives, model portfolio, and terminology document for a full week. If during the week you decide the subscription is not for you, or the shorter term trading strategies don’t suit you emotionally than simply cancel your subscription by following the directions on the homepage prior to your week expiring. If you do enjoy the newsletter then simply do nothing and your subscription will convert to a yearly membership at the end of the one week trial. Click here to link to the premium website. You will find the subscribe link on the upper right-hand side of the home page. This entry was posted in Uncategorized on November 24, 2011 by Gary. This entry was posted in Uncategorized on November 20, 2011 by Gary. Interview with Tekoa Da Silva of the Contrary Investor Cafe. Another portfolio change has been posted to the website. This entry was posted in Uncategorized on November 17, 2011 by Gary. We all better hope I’m wrong on this one, but I think the CRB just put in its three year cycle low in October. I’m also afraid that Bernanke has done irreparable damage to the dollar. If I’m right about both of those assumptions then we are on the brink of a historic inflationary period. The dollar is now a great risk of forming a left translated three year cycle. A break below the October 27 intraday low would initiate a pattern of lower lows and lower highs of an intermediate degree.That is usually a sign that a major cycle has topped. If the dollar’s three year cycle has topped after only five months we will be at great risk of a severe currency crisis in the fall of 2014 when the next three year cycle low is due. 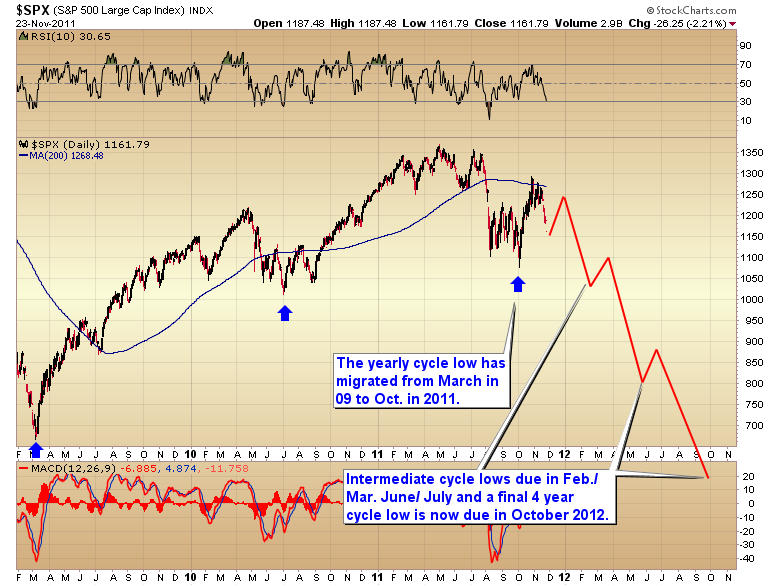 Even more concerning is if the CRB cycle has bottomed. 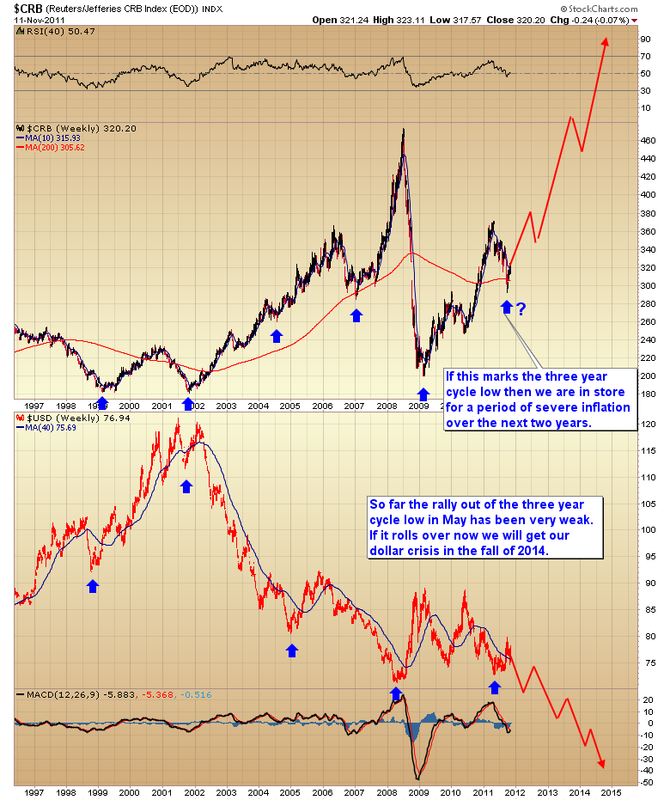 If it has then commodities are poised for a huge surge higher during the next two years as the dollar deteriorates. The next two weeks are going to be critical for the dollar. It must hold above the October 27 low. Failure to do so would indicate that the cancer has now infected the currency markets, most specifically the US dollar. 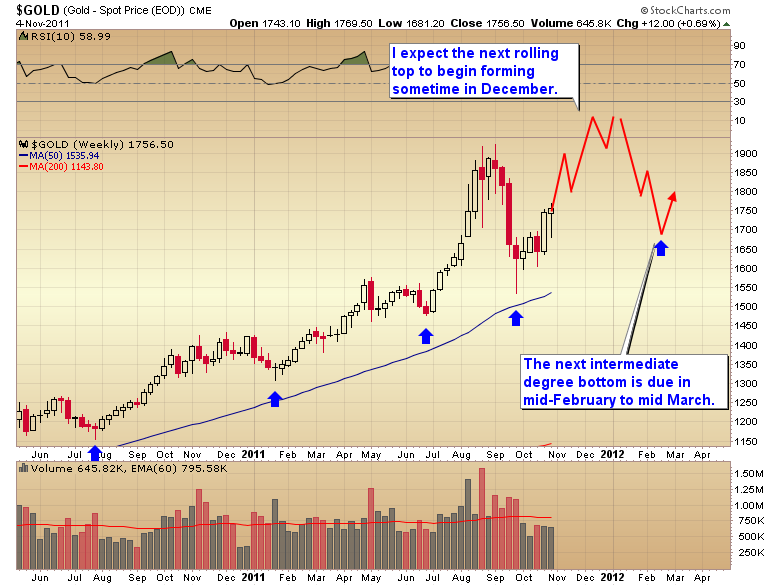 If this scenario unfolds it has the potential to drive the bubble phase of the gold bull market. This entry was posted in Uncategorized on November 14, 2011 by Gary. This entry was posted in Uncategorized on November 9, 2011 by Gary. Gold has now confirmed that an intermediate bottom was set on September 26. The double bottom at $1600 is a powerful basing pattern that should generate a test of the $2000 level by sometime in December. For reasons covered in the nightly reports I don’t really expect gold to push much above the $2000 level during this particular intermediate cycle. Also for reasons discussed in the nightly reports I think the mining stocks, which have been unloved for the last year, are probably going to be the recipients of most of the hot money during this intermediate cycle. Both silver and gold have already generated parabolic, or semi parabolic moves. I think it’s time for a big rally in the mining stocks over the next four or five months. This entry was posted in Uncategorized on November 6, 2011 by Gary.